In Xanth, everyone has a talent. But that doesn't mean everyone loves his talent, and no one understands that better than Hapless. Endowed with the ability to conjure any instrument he wants, Hapless could be an extraordinary musician if only he could play a tune that didn't fall ear-piercingly flat. His one desire is to find an instrument he can play-and maybe a girlfriend or three. But like music, women have never been his forte. When the Good Magician hears about Hapless's desperate desire, he sends the young man on a quest to find the elusive Isis Orb, a magical talisman that could fulfill his wish. But the mysterious Egyptian goddess for whom the orb is named guards the enchanted object and won't let anyone see it-let alone use it. Setting out to achieve the impossible, Hapless meets an eclectic mix of creatures that join him on his journey. Like the musically challenged Hapless, they all have wishes they hope the Isis Orb will grant. But the only way they can control the orb is to capture the five totems from the regions of Xanth: Fire, Earth, Air, Water, and the Void. Together, this motley crew will heroically fight dragons, a six-headed griffin, and even a beautiful, seductive water gorgon who tries to rain on Hapless's parade. With its thrilling exploits and endless humor, the newest addition to Piers Anthony's beloved Xanth series is sure to keep readers enthralled. 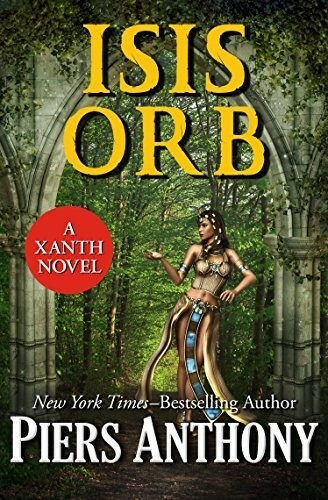 Isis Orb is the 40th book in the Xanth series, but you may enjoy reading the series in any order.